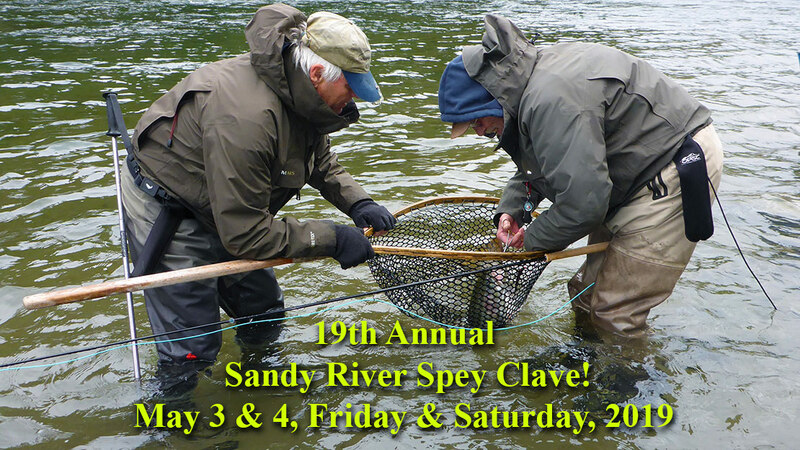 Announcing the 19th Annual Sandy River Spey Clave! What is the Sandy River Spey Clave? It's a gathering of anglers interested in two-hand fly rod fishing. It provides a format for the exchange of Spey casting and fishing information. It's a mostly free Spey casting college open to everyone. It's a show for your entertainment. It's a place to rub elbows with the best Spey casters and steelhead anglers in the World! It's held on the best kept urban river in the world! It has been termed, "The Woodstock of Spey Casting Events!" The Sandy River Spey Clave brings the largest collection of Spey fly fishing tackle to be found anywhere in the world at any time. Companies such as Sage, RIO, Redington, Tibor, R.L. Winston, Echo, Simms, Airflo, Nautilus, Umpqua, Hardy, Scientific Anglers, Royal Wulff, Lamson, Temple Fork Outfitters, Thomas and Thomas, Bruce & Walker, Farlex Reels, Saracione Reels, Anderson Custom Rods, Beulah Rods, Hatch Reels, Pro Tube, Loop Tackle USA, and many more will be there. The best part is that you can try out all of this great gear on the water free of charge. 18 FREE Educational on-the-water fly casting/fishing demonstrations. This year The Fly Fishing Shop will be joined by: The Portland Fly Shop, The Gorge Fly Shop, and Pacific Fly Fishers Shop as sponsors (there may be other shops as well). The Sandy River Spey Clave has reinvented itself many times. 2019 will be full of surprises. Watch this page for updates as more details become available! The 19th Annual Sandy River Spey Clave is taking shape! This information will be updated periodically, thing are still in flux. Friday is "Beginner's Day," which focuses on introducing new anglers into the sport of Spey fishing. Male and female instructors and presenters will be mixed into both days of the scheduled on-the-water programs. Friday morning will feature 6 on-the-water presentations that will be structured to provide beginners with the most complete understanding of how to cast with a two-hand fly rod, from the most basic moves to an in-depth understanding of more complex casts. Don't be late, presentations start at 9:00 a.m. sharp. Lesson #1: The most basic information: How does a single-hand or two-hand fly rod work for you? The best athletes in any sport have the best fundamentals. This program is about essential casting fundamentals. Lesson #5: Preserving Casting Accuracy: Accuracy is as important as distance. Mia will explain and demonstrate moves that enable you to cast with great precision. Lesson #6: Adding Distance: You can only catch fish you can reach. This is one of the few provable statements about fly fishing. Brian will share his knowledge acquired as a tournament distance caster so that you too will be able to cast long lines. To help defray expenses, this year there will be a $25 fee for this instruction, which will last for 4-hours, on the water. Rod/reel combos will be provided. Some waders will also be provided, but we strongly recommend that you bring your own. This class will be limited to the first 100 students that sign up. SIGN UP HERE. Saturday will feature twelve presentations by some of the biggest names in the Spey game. Lesson #1: What Spey cast to use where, when and why. Lesson #3: The D-Loop Stroke: Where the Magic Happens . Lesson #4: Identifying & Fixing Common Spey Casting Faults. Lesson #7: Control your line and control your Spey cast. Lesson #11: How not to get 'em. The Sandy River Spey Clave brings the largest collection of Spey tackle to be found anywhere in the world at any time. Companies such as Sage, RIO, Redington, Tibor, R.L. Winston, Echo, Simms, Airflo, Nautilus, Orvis, Hardy, Scientific Anglers, Royal Wulff, Lamson, Temple Fork Outfitters, Thomas and Thomas, Bruce & Walker, Farlex Reels, Saracione Reels, Anderson Custom Rods, Beulah Rods, Hatch Reels, Pro Tube, Loop Tackle USA, and many more will be there. The best part is that you can try out all this great gear on the water free of charge.